Periodically, I design a new personal training program for this client of mine. 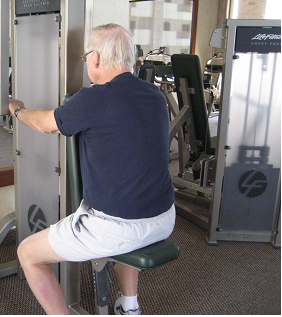 He's 75 years old and has been committed to exercise now for several years. After suffering from some serious health challenges, he has made the commitment to take better care of himself. He spends time between two homes here in Mexico and in Tucson, Az. While in Tucson, he works with a personal trainer there. During our workout session, I wanted to include some balance exercises in his workout program. He said his other trainer had also included some balance exercises but that he didn't like doing them. He said he liked doing the weight training but didn't care for the balance exercises. I asked him why he didn't like the balance stuff and he said, "I don't like doing things that make me feel uncomfortable. When you get to my age, you avoid doing those things that you don't like, that make you feel uncomfortable." I told him maybe it was the way he was doing the exercises that was the problem. You see he would wait and do the balance stuff at the end of his workout. Knowing that he enjoyed the weight training, I decided to combine a weight training exercise with one balance exercise. I selected a balance exercise that was easy, but effective to do. By the time we finished, he really liked the program AND he was enjoying doing the balance exercises. Well, kinda. I've been thinking about the comment he made about "not wanting to do anything that makes you feel uncomfortable as you get older". I hope that as I get older, I am always doing something that makes me feel just a little uncomfortable. Then I will know that I am still growing and learning. I'm 62 and have to exercise almost every day.I'm sitting at my office almost ten hours every day so I need to train..